Gnocchi has always been in the category of “way too much effort and probably not worth the time” in my mind. That is, until I found a recipe for ridiculously easy ricotta gnocchi. Yes, I feel like I’m cheating. Gnocchi should be made of potatoes, right? But alas, I lack a potato ricer and didn’t want to splurge the $11 it cost to buy one at the grocery store. Lame, I know. But, despite me feeling like a total impostor, faking my way to a delicious Italian dinner, it was actually good! The browned butter gave it a nice flavor as well, without taking too much attention to the gnocchi itself. With a bit more effort these could be way more attractive (whoops), but the taste and texture was really quite lovely. For my first try at gnocchi, I’m deeming it a success. Next time I’ll graduate to potatoes, and perhaps even splurge for a potato ricer. Oh my! I decided to go for spinach gnocchi because I am a total spinach fanatic, and didn’t want just plain gnocchi. That and I’m not a huge fan of the flavor of ricotta on its own. I always try things with it (e.g. ricotta lasagna) and end up really disliking the homogenous nature of the taste. 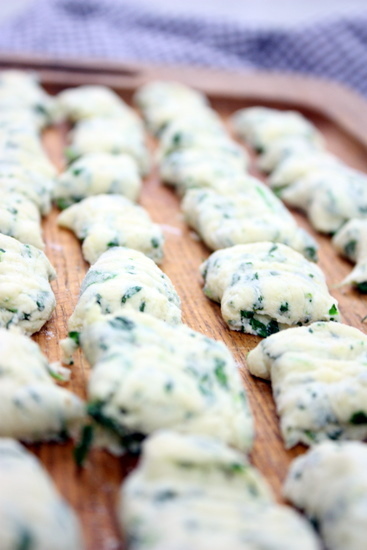 That said, adding in some spinach worked miracles for the taste of these gnocchi. I simply cooked and chopped my spinach, but for aesthetic appeal I would maybe recommend blending it in a food processor or blender first. I read recommendations saying to be careful, lest it liquify on you, but I imagine a quick blend would give it a much better texture to incorporate better into your gnocchi. 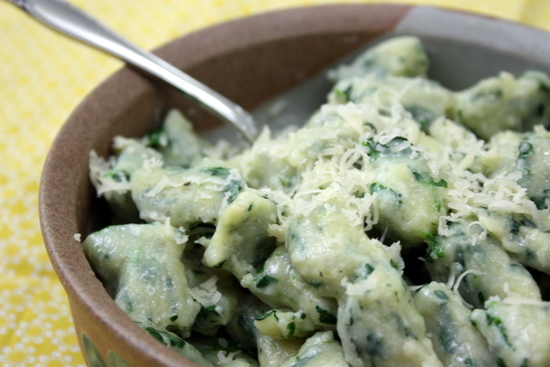 Soft ricotta gnocchi is speckled with fresh spinach, and served in a nutty brown butter sauce. It might sound hard, but it really isn’t! Combine all gnocchi ingredients in a bowl and mix (hands work best) until completely incorporated and smooth. Add flour as needed until you have a smooth ball of “dough” to work with. Break off pieces and roll into logs the size of your pointer finger. Cut with a knife into small pieces, 1/2 to 1 inch in length. At this point, make the browned butter. Melt butter over medium heat in a sauce pan, swirling continuously. Cook until butter starts to brown and flecks appear on the bottom of the pan. Remove from heat and pour into a separate container. Working in batches, place the gnocchi in a boiling pot of water and cook until they float to the top. Drain, toss with browned butter, top with parmesan cheese, and serve! 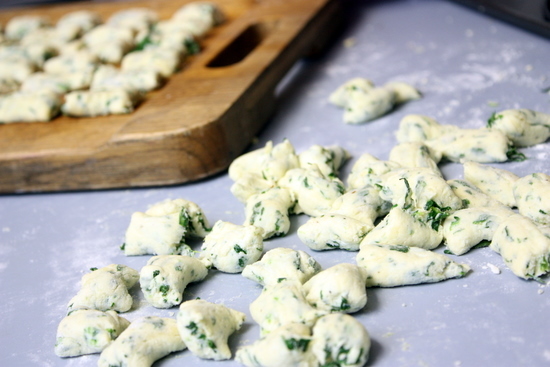 My flour measurements are very roughly estimated – use as much as you need to be able to work with the dough, but keep in mind that the gnocchi will get more dense and firm with more flour. 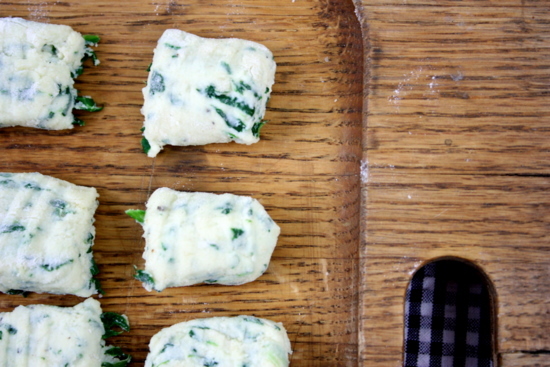 Gnocchi should be light and fluffy, so use as little flour as you can get away with. I can’t wait to try this recipe! I bought an extra tub of ricotta and need something to make with it! Thanks for the recipe! !